Praise the Lord for all that He is doing at this amazing time! With so much prophetically coming together, we should not be surprised to see how the Lord is working in our hearts and lives - confirming the time, and calling us closer to His side! Where are the Fellow Servants? This is the updated and expanded second edition! We've compiled a variety of information concerning the prophetic time to be watching, Christ's instructions to His servants, the timing of His comings, and the Old Testament prophecies that pointed to this time. 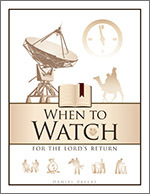 This is a great resource, especially when so many are confused about what time to be watching and expecting our Redeemer! Showing and exploring the two-fold nature of the natural law: for every "thou shalt not" there is the corresponding "thou shalt." Next to each command is various examples from Scripture of how we put these into practice. We are either going the way of darkness, or we are putting on the armor of light. This poster is a complement to our other PDF book, The Covenants. Let us review God's Word, and get a deeper sense of the spirit and truth that God desires when (and how) we worship Him! 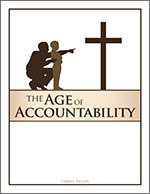 The age of accountability is a question that often comes up in discussion regarding the rapture. However, to best understand the subject, we must look beyond the short term, and ask why is anyone accountable to God at all? It is a heart issue. When we see ourselves as God sees us, we get a stark reality check - that also reminds us of the grace and mercy that He offers through Jesus Christ. 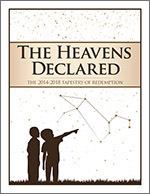 Accompanies The Covenant book, and illustrates what has the believer been grafted into? What does it mean to be Abraham's seed? Are we grafted into the branches - or the root? By examining all of these, it becomes more real to us when we look up - just like Abraham! This takes an in-depth look at what has the believer been grafted into? What does it mean to be Abraham's seed? 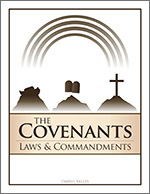 Did Christ abolish the Mosaic Covenant? Did He tell His disciples that He was going to? How did the early Church put their faith into practice? Were we grafted into the branches - or the root? And so much more!! By examining all of these, it becomes more real to us when we look up - just like Abraham! The more that we study God's stated requirements for the appointed times, the more we see His emphasis on the firstfruits - and that the appointed times have their own seasons that they must be observed in. By studying God's celestial clock - and the seasons - we see how they were meant to go together - providing incredible prophetic shadows and patterns that the apostles referenced. 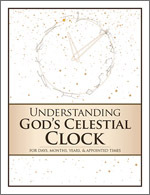 We will have the best understanding of the time, when we study what God says about it! 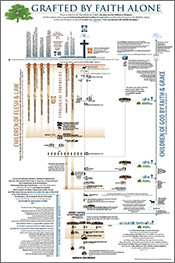 PDF poster, 24" x 36"
A great timeline, showing an overview of Christ's instructions and warnings concerning the sequence of events: the days of Noah and Lot, the Tribulation, the Kingdom, and the Great White Throne. The Lord has recently reviewed for us what the heavens have been declaring - and underscoring that our redemption is nigh even at the door! We can see the sum of the story, on God's celestial clock. 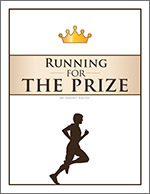 We should not be surprised at this time then, that the Lord also urges us to finish strong - to obtain the prize! Now is the time for extra vigilance against false teaching that would take our crown! ...and all that goes with having a crown... Let us be found the wise and faithful servants, serving our Redeemer - FIRST - and highest above all else. 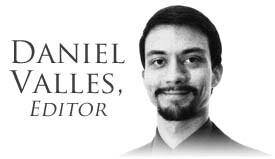 Since 2003, Daniel Valles and informedchristians.com have served to prepare quality Christian teaching and learning material, as well as providing a Christian perspective to understanding the times and prophecy. If the materials and labours have been a blessing to you, please help support this ministry! We are 100% fellow-servant supported! (c) 2019 informedchristians.com. All rights reserved. A ministry of Daniel Valles. This site is not affiliated with any church, organization, institution, college, group, etc.